Security cameras are getting smarter all the time. It seems like every new camera that comes out is flaunting its ability to identify people from animals, and even in the case of the Nest Cam IQ, identifying familiar from unfamiliar people. But that doesn’t seem far enough for Lighthouse AI inc, the company behind the eponymous Lighthouse AI security camera. Unlike other cameras, Lighthouse has been built with AI as its starting point. What that means is that as well as the ability to identify familiar people, it can also learn patterns and respond to natural speech. What this means is you can ask Lighthouse “What time did my kids get home yesterday?” and it’ll be able to show you only the relevant footage. As well as a camera sensor capable of delivering a 1080p live stream, the Lighthouse also features a 3D sensor, night vision, a microphone and speaker for two-way audio, and a security siren. 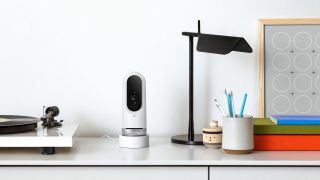 That 3D sensor sets Lighthouse apart from other intelligent cameras like Nest’s Cam IQ, allowing Lighthouse to monitor movement, so you can request to see footage of (for example) running or jumping. You can even set up gestural commands, so if the Lighthouse detects waving, it can issue an alert to the main user’s smartphone, which in the promotional video (below) is used to show off a snazzy tin-foil suit, but could have potential life saving applications if you happened to be choking or having a fit alone at home. The company is helmed by industry leaders in the automotive vehicle field Alex Teichman and Hendrik Dahlkamp, and was backed by Android co-founder Andy Rubin’s Playground Ventures fund. Lighthouse is available now in the US at $299 (about £215, AU$380). We’ve no word yet about international availability or price, but will let you know when we have more information.